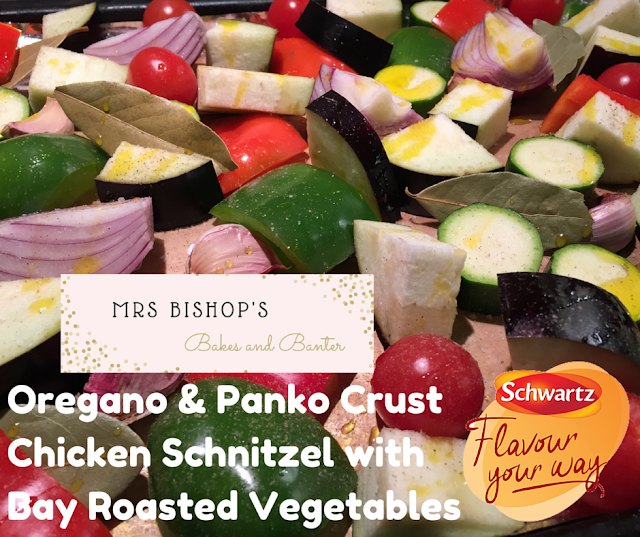 Mrs Bishop's Bakes and Banter: RECIPE: Oregano & Panko Crust Chicken Schnitzel with Bay Roasted Veg...in association with Schwartz. 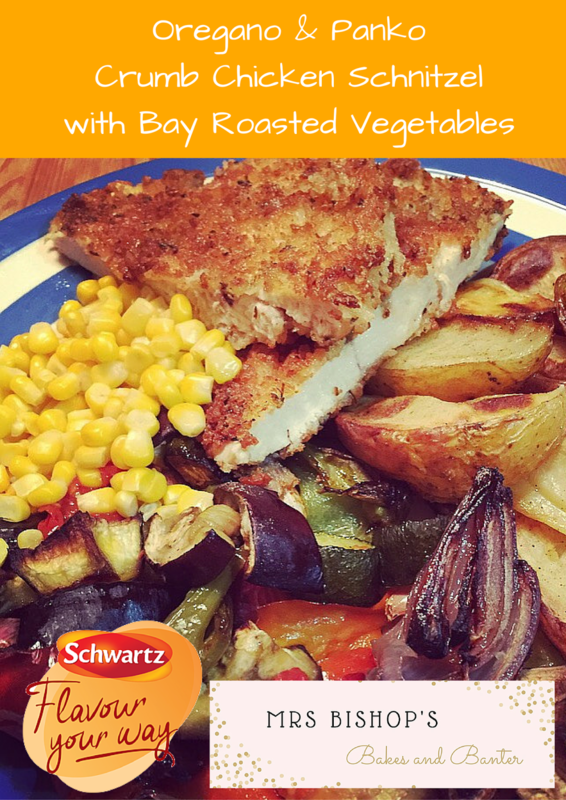 RECIPE: Oregano & Panko Crust Chicken Schnitzel with Bay Roasted Veg...in association with Schwartz. 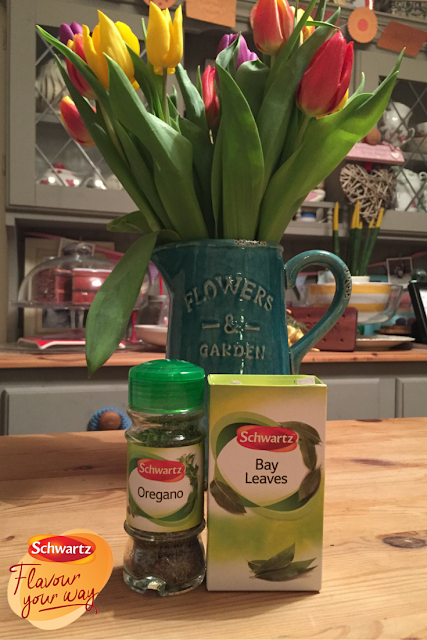 Today I'm bringing you a brilliant family-friendly recipe in association with Schwartz. This scrumptiously satisfying recipe will be sure to please every member of the family. It's quick to make, fuss-free and uses easy to get hold of ingredients and store cupboard staples! I used Oregano and Bay to flavour these simple ingredients and elevate them to the next level. Chop all your vegetables into similar sized pieces and arrange on a baking tray. Drizzle with olive oil, tuck in Bay leaves and season well. Chop your potatoes into very chunky wedges, rub with olive oil and place on a baking tray, covering them with plenty of salt and pepper. Once oven has reached temperature place both baking trays inside and set a timer for 40 minutes. Prepare your chicken: using a very sharp knife cut your chicken breasts almost in half down the long side of the breast - this is called butterflying your chicken breast. You should then be able to 'un-fold' your breast, so that it forms one much thinner but larger breast piece. Do this for each breast and place each one into a plastic sandwich bag. 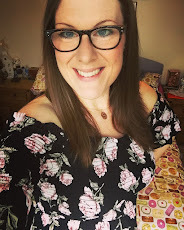 Using a rolling pin, bash the chicken breasts through the plastic bag, making it thinner (and therefore much quicker to cook), you want your breast to be about 1.5cm in thickness. This will also tenderise the meat. Get three dinner plates out of the cupboard & place the seasoned flour on to one, the beaten eggs onto another and finally mix the panko breadcrumbs, oregano and seasoning on the final plate. You are now ready to coat your chicken breasts. Using one hand to dip into the dry ingredients, and the other to dip into the wet egg, take each chicken breast out of its plastic bag and dip it first into the flour, so it is well coated on both sides, then the egg, again on both sides, then finally dip it into the oregano panko crumb, ensuring the chicken breast is nicely covered with an even layer. Repeat the coating process with each chicken breast. 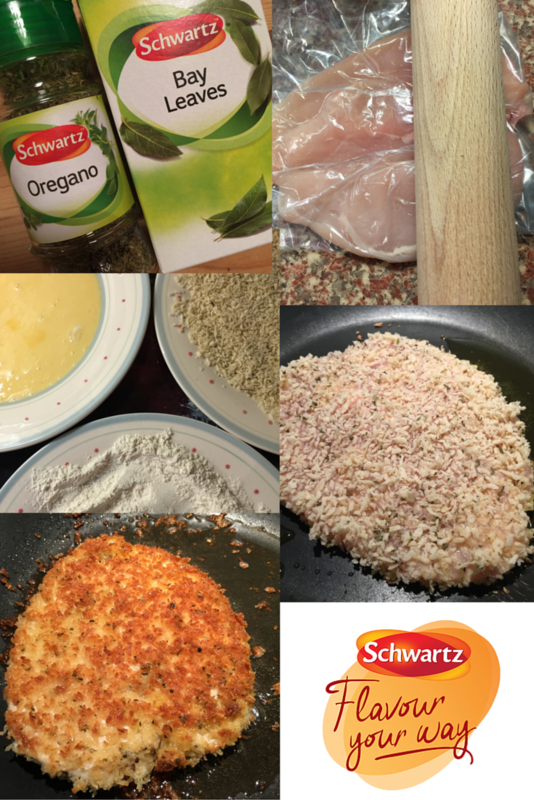 Next, heat up some oil in a frying pan and put on a high heat - once very hot, turn down the heat to medium and add your chicken schnitzels (one or two at a time). They will need to cook for about 2-3 minutes per side, until golden and cooked through. Use tongs to flip your schnitzels in the pan. Stay with them as the crumb can burn quickly. Once cooked remove from the pan, and keep warm in the bottom of the oven on a baking tray while you fry the others. Put a small pan of salted water on to boil, and when there's just 8 minutes left on your timer, add the frozen sweetcorn and boil on a medium heat until tender. You should now be in the position where everything is cooked through and ready to serve. Take your veggies from the oven and pick out the 6 Bay leaves and discard. Cut your schnitzels in half and arrange on the plate with the roasted vegetables, wedges and sweetcorn. Preparing my veggies - adding 6 Bay leaves to your tray will deeply enhance the flavour, perfume and sweetness of your vegetables. This dish is such a winner in our house. I love how you take a simple chicken breast and turbo charge both its texture and flavour - the chicken inside the crust remains juicy due to the tenderisation and fast cooking time, and the crumb is decadent, crispy and oh-so-satisying! For little eaters you could cut the cooked schnitzel into smaller, bite sized pieces/strips - this is a real winner with my toddler (think "posh" chicken nuggets/dippers). If you haven't heard of panko breadcrumbs before, they are a special Japanese coarse bread crumb which is available in the world food aisle of most supermarkets - I would hugely recommend you seeking out panko specifically as it is a far superior crumb in both flavour and texture. Of course, you can use any other style of breadcrumb, but the overall finish won't be the same. How do you like to use seasoning and herbs in your home cooking? 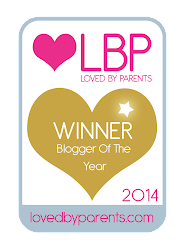 Please do let me know if you give this recipe a try - I hope it's a winner in your house too! This post is in association with Schwartz. 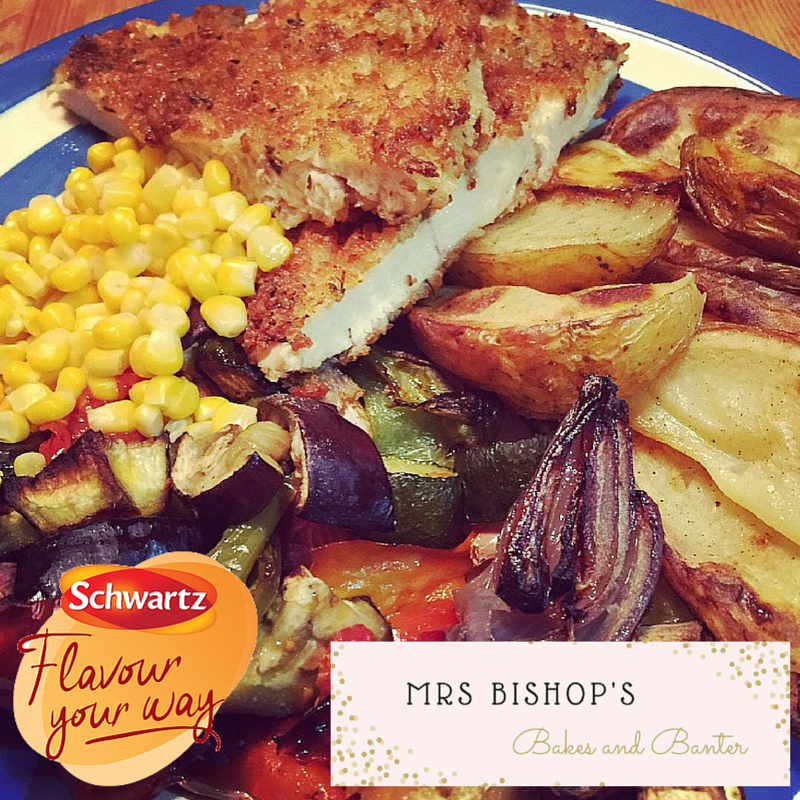 I developed the recipe using inspiration from the wonderful range of dried herbs available from Schwartz.